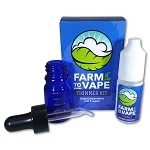 Depending on what tank you use and quality of concentrate determines your mixing ratio. Premo concentrates in an oil hole tank can mix 1:1. Lesser quality concentrates have cellulose waxes and PG/VG style vape pens are designed for a thinner viscosity which means up to a 1:3 ratio may be required in some circumstances.